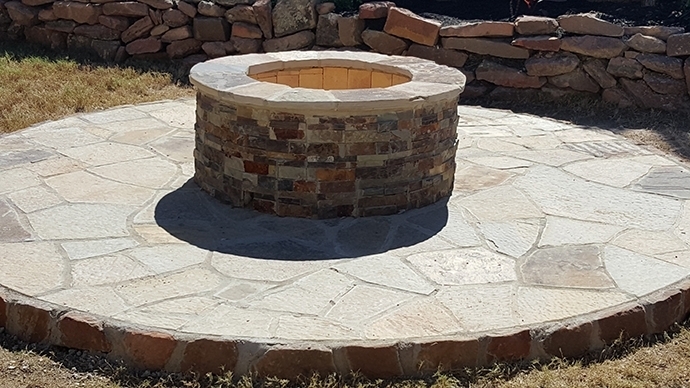 Installing a firepit for any outdoor space means extending the number of hours one can enjoy spending outdoors, and giving a cozy gathering space for everyone. To ensure the firepit is installed where it can cover the maximum amount of outdoor space, here are 5 factors to consider. There are customized or built-in types, pre-fabricated kits and even portable ones. The installation process of a firepit mainly depends on the type of firepit you’d like to install in your yard. Customized firepits may take longer to install but allows for design changes anywhere along the way of installation. Pre-fabricated kits are easier and faster to install; however, you need to make sure your space fits the specifications the kit needs. For small spaces, a portable firepit is highly recommended. You can even take it to camping trips. Aside from your yard size, you should also determine the maximum number of people it can accommodate. There’s also the question whether you’d want an in-ground or above-ground firepit. If it is above ground, height is important and should make you comfortably warmed up while sitting. Location is everything when it comes to installing a firepit. Put it in a corner and it might leave the rest of your patio too cold. You can have it installed right in the middle of the patio, surrounded by customized seats or even right up on the table if it strikes your fancy. When it comes to firepit fuel, you can have either gas, propane, wood, or even ethanol. Each one comes with its benefits and downsides. If you already have a gas line ready to be tapped into, gas may be the most convenient pick for you. If you’re considering a pre-fabricated kit, most of these kits run on propane. Then there’s the classic wood firepit, and the earth-friendly ethanol. Firepits are not just gathering places; it can also serve as the main design element of any yard when done right. You can have it complement or contrast with the rest of the patio through its paving material. Flagstone patios lend an elegant and lively look to anyone’s patio. Made of natural, roughly cut stone slabs, see remodeled Sugar Land flagstone patios we’ve installed over the years. Find more of what this natural stone patio material has to offer when installed the right way for Sugar Land patios below! Giving a glossy finish to this flagstone patio, it gives a smooth patio surface which works very well in contrast to its brick walls. Properly installed and applied with the right finish, a flagstone patio will remain shiny and presentable for a long time. We’re sure this patio will host many afternoon chats for decades. A spectacle in itself, the right flagstone material can create a lively abstract mosaic which livens up an otherwise empty patio space. If you have a base, you can opt for a thinner flagstone. However, if you’re directly laying flagstone onto the ground, a thicker cut is preferred for longevity and durability. Flagstone with its variety of colors is also a favorite patio material for pool surrounds. With its red, blue, and brown hues, a flagstone provides a great contrast against your pool and encourage vivacity and fun! Since it surrounds a pool, allowance for proper drainage and a textured surface must also be included to avoid accidents. This flagstone installation projects a rustic and casual look to the family outdoor room. Irregular stone cuts were installed to achieve this textured, rustic effect. Using a wet installation method, the flagstones were installed on top of a concrete base for a more even, durable surface. For more flagstone patio samples, browse our flagstone patio gallery. Feel free to also browse our other patio surface gallery for inspiration. If you’re still unsure whether flagstone is the right material for your outdoors, call us today for a free, no-obligation consultation! Being a homebody need not be boring. Venture more outdoors by transforming your outdoor space into a high-quality relaxing space. Start an outdoor lifestyle today with these 5 guidelines! Fill your patio with colorful and playful tones. Create a space specifically for a top activity you love. Designate a workspace for your visual arts hobby, a gardening table, or a simple workspace table in your outdoor area to encourage you more in spending more time in your patio. Once you’ve turned working, creating, or crafting for your passion in that area, you’ll no longer see your outdoor space as a mere extension of your property but as a special space where creativity begins. Input Zen-inspiring elements for a calming ambiance. Think of what calms you down. Is it the sight of a gently roaring fire, giving off a warm glow and atmosphere? Is it the sound of a gently running stream or water feature? Is it the scent of calming, fragrant plants like lavender or chamomile? Integrate any element which makes you feel calm. Take it a step further with an outbuilding. It can be a he-shed, she-shed or even a grownup’s version of their dream playhouse. While majority of the space within your property is meant for sharing, create an outdoor space you can truly claim as your own territory where no one can disturb you if you are there. Create winding sections and spaces for your outdoor. Challenge your exploratory sense by creating a maze-like layout for your outdoor space. Keep things exciting with an adventurous take on your outdoor space. Much like the classic The Secret Garden, transform a straightforward outdoor area into a place of wonder and paradise designed for you to enjoy. Patio covers help make our outdoor spaces become more functional rain or shine. In this article, we tackle 5 patio cover features that make for a stylish patio cover. Sturdy pillars make for a sturdy patio cover. For an extension of the roof, ensure your pillars are built on stable ground. Strong pillar materials can range from reinforced cement or steel beam to even wood that can withstand harsh weather elements. Another patio cover feature you need to consider is ample support for the extended roof. Aside from pillars, you can also opt to have your angled roof along with its sturdy beams exposed for a rustic look. Even with a thinner cover, there is still enough space for recessed lights and ceiling fans. Whether it’s attached or recessed, lights are an important feature in patio covers. Picking the right spots to install them will help brighten up your space at night and maintain a welcoming aura for your patio cover. Despite the open orientation of your patio-covered outdoors, it can still feel stuffy. With a raised ceiling, you will have more room to allow enough cool air to pass and drive out warm air. This home in particular even extended their wooden ceiling material meeting their brick wall exterior and provide a good contrast. Meanwhile this home opted for a uniform ceiling and wall feature, making their outdoors look bright even with the patio cover installed. Though a raised ceiling can help your patio feel less humid, ceiling fans attached over the seating area help move air around when the wind is not so friendly. While electric fans on the ground are a great option, ceiling fans maximize your space, making more room for your seating furniture and other outdoor implements.